Learn more about the technologies behind our world-class products and systems, or how to solve common, but challenging applications. 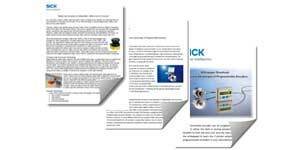 SICK's growing library of white papers cover a diverse range of topics. Check back often for the newest white papers. Light Curtain or Safety Laser Scanner?